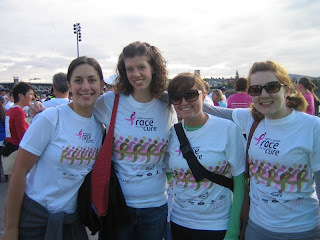 Yesterday Laura, Trish, Leta and I did our part for Race for the Cure. 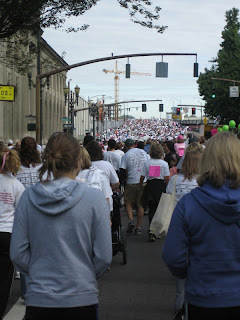 There were over 47,000+ people that showed up in downtown Portland to participate in the 5k walks and 5ks runs to raise money for breast cancer. Approximately $3 million dollars was raised in the Portland area alone! It felt really good to be a part of something that turned out to be so huge. We are talking about setting up our own fundraising for next years race... we each donated $25 (for a total of $100 from the four of us). Next year we would like to raise even more! We've started to come up with some really good ideas already, so let me know if you would like to join us and be a part of it!